La Sagrada Família is one of the most famous buildings in the world, and is certainly the most visited site in all of Spain. When you visit a place that has been on your bucket list for a long time, it is often disappointing, because you set your expectations so high. That is definitely not the case for La Sagrada Família. It is everything you have ever heard and more. It is popular, and crowded and expensive to go inside, and you might be temped to give it a miss, but you would be making a big mistake. You haven’t been to Barcelona if you didn’t go to La Sagrada Família. An artists impression of the completed building. La Sagrada Família is one of the most inspiring buildings in the world. Designed by architect Antoni Gaudí, and started in 1883, it is still under construction, planned to be complete by 2026, the 100th anniversary of Gaudí’s death. Gaudí knew he would not live to see the building completed. Over the years, other architects and designers have continued Gaudí’s vision. For example, there are currently 8 spires; when it is finished there will be 18, including the grand 170m ‘Jesus Tower’ in the centre. Here is an image showing how much work is still to be done. This video is a one minute animation showing the planned future construction. When finished, it will be the tallest church in the world. There are three facades, each one designed to tell the story of the Christian gospel. The Nativity Facade is the only section that was essentially completed within Gaudí’s lifetime, and features scenes from the birth of Jesus, together with Gothic style symbolism, images from nature, and Modernista asymmetry. You could spend hours examining the many and detailed carvings covering the facade. The Nativity Facade. We were there at the wrong time of day for this photo. The facade is covered with finely detailed carvings illustrating stories from the birth of Jesus. You enter currently via the Nativity Facade, but eventually that will be a side door, and the main entrance will be the Glory Facade, which is the least complete at this stage. Gaudí worked to complete the Nativity Facade before starting the others, to attract more public funding. He purposely left the Glory Facade’s design open for later architects, knowing he would not live to see it completed. The Passion Facade was our favourite. The spires were designed by Gaudí but the lower part was ‘reinterpreted’ by Josep Maria Subirachs (1927-2014) who completed the work in 2005. The various scenes tell the story of Christ’s suffering and death. The style is severe and much more plain, but the expressiveness of the sculptures is very moving. 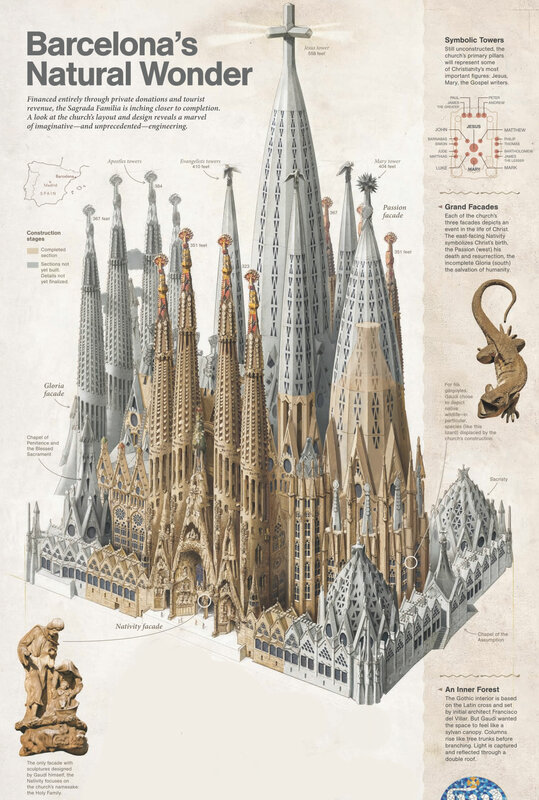 These sculptures were controversial, and many people thought they did not reflect Gaudí’s original concept, but Gaudí had specified that this facade should be grim and terrifying, and the overall, skeletal structure was designed by Gaudí, intentionally quite different to the other facades. The Passion Facade in the afternoon light. Peter, after he realises he just denied Jesus 3 times, as predicted. The helmets worn by the guards are a tribute to the chimneys of Gaudí’s La Predrera. The man on the left bears the face of Gaudí himself. I could have spent hours enjoying the exterior of the building, but we had an appointment and more to look forward to inside. We had been told about the quality of the light inside the basilica, but nothing prepares you for the reality. It’s a huge space, with soaring columns resembling a forest of tree trunks supporting the roof. The tree trunks are structural as well as decorative. The columns are inclined and branched – like trees. This was ground-breaking architecture. Gaudí created a knotted rope construction in which the columns correspond to the ropes. He turned the construction of the pressure points and hung small weights. In this way he was able to simulate the pressure gradients in the columns. The weight of the towers will be routed directly over the pillars into the ground – without the need for thick walls or external buttresses. Ingenious! Because of these columns, there is more room for huge windows which allow the light to fill the space in a dramatic fashion. The windows facing the east are coloured in shades of blues and greens, to capture the cool morning sun, while the western windows are ablaze with reds, yellows and orange. The longer we were there the more the light flooded the church and we didn’t want to leave. Gaudí said that colour was the expression of life, which is why he decided to make its presence felt in the Sagrada Família. My photos hint at the effect of the light, but it really has to be experienced in person. The windows bear the names of saints and sanctuaries to which they are dedicated. The Baldichin is dripping with symbolism, such as the grapes and shafts of wheat, symbolising wine & bread. Inside the Glory Facade. The glass is clear – not sure if it is unfinished, or because it will mostly be covered when the facade is completed. The glazing was inspired by Gaudí but designed by glass artist Joan Vila-Grau. As the afternoon wore on, the light reached into the altar and shone on the organ pipes. Honestly – this is not an exaggeration of how it looked. Many of the windows have a traditional gothic shape, but the imagery is non-figurative, mostly. I could go on and on. (OK, I know, I already have). This is a one of a kind building, and the more I read and learn about it, the more fascinating it is. I haven’t even written about the school built on the site by Gaudí in his signature style, with curves walls & roof, for the children of the construction workers; the columns at the entrance supported, one by a turtle and one by a tortoise, to symbolise both the land and the sea; the tops of the spires decorated with Murano glass to represent the bishops mitre, ring, & cross; the brightly coloured bowls of fruit, and many images from nature – reptiles, shells & more; the crypt below the church where Gaudí himself is buried; the huge bronze doors of the Nativity Facade, designed by Japanese sculptor Etsuro Sotoo, covered with of metal leaves, flowers and insects. You’ll just have to go and discover it all for yourself! Posted in Europe, SpainTagged Antoni Gaudí, architecture, Barcelona, Catalonia, Catalunya, Church, Gaudí, Glass Art, La Sagrada Familia, Modernisme, Stained GlassBookmark the permalink. Amazing and stunning! Thanks for taking me inside – definitely on my bucket list! Hope you get to go soon Lisa! Thank you for the wonderful description and photographs. I will be there in April and can’t wait to see this masterpiece. Love your writing! Oh, that’s exciting Sandy! I know you’ll have a great time! Thanks Kathleen. I thought that video was so interesting. I hope I get to see the finished building one day! Glad to know I wasn’t the only one to be amazed!